Place was very clean, staff was very friendly, overall great experience. Very nice facilities, very clean, friendly staff. Optional organized tours to Chernobyl. The cafe/bar on site is quite good as well. A little bit out of the way, but located right on a great souvenir shopping street, and an easy walk into the historic city center. The best hostel I’ve ever stayed in. Everyone was so friendly and helpful, food at the cafe was great, location was perfect, and everything was very clean. Highly recommend! Seriously by far the best hostel I have ever stayed at, make sure you jump on the bar crawl was fantastic and the food as well was shockingly really good for a hostel. Very impressive 100% recommend. I arrived at 4am and they let me check in late (luckily there was a bed). They assisted with whatever query I had. They also celebrated their 7th anniversary and held a BBQ. Bringing everyone together with food and drinks. Lovely atmosphere! And amazing staff too! Would highly recommend! Loved the room, cleaning was done very regularly, and staff were super helpful. 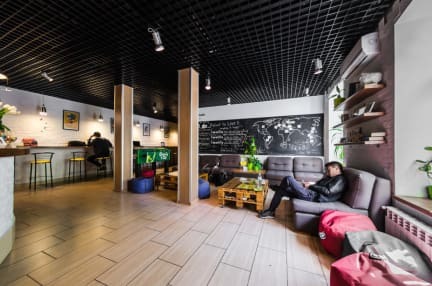 The only downside of this hostel was there wasn't much of a social atmosphere - but could sometimes find another traveller or two in the attached bar/cafe - which also had good reasonably priced food. Location was difficult to find based on directions. Around 25-30 mins walk from a hill; the hill is the route to the main part of the city which was difficult to climb up every morning. Ubers were dirt cheap ($2/£1.50 a ride) so easy to get around. Hostel wasn't sociable at all. No one came for breakfast (though café was nice with decent options). Top bunk was not easy to climb up or down. Not located many stores etc so a bit of a walk. Best point was radiator and heating in the room. Well for 12 dollars a night in an 8 bed dorm this place certantly needs to step up its game some. For starters there are 3 hostels in town located much more centeral offer 4 bed dorms with breakfast and a towel for 6-7 USD per night such as "hostel Z. This place wont give u either with double the people in a room. Another issue here is no hot water and the 1st 2 days no running water. And yes location. the center is atop a hill this is on the bottom of it. So conclusion not worth 6 more bucks.